Can't find the perfect table? No worries - here's how to add your personal touch to a generic, mass produced coffee table. Wipe down glass table top with alcohol. 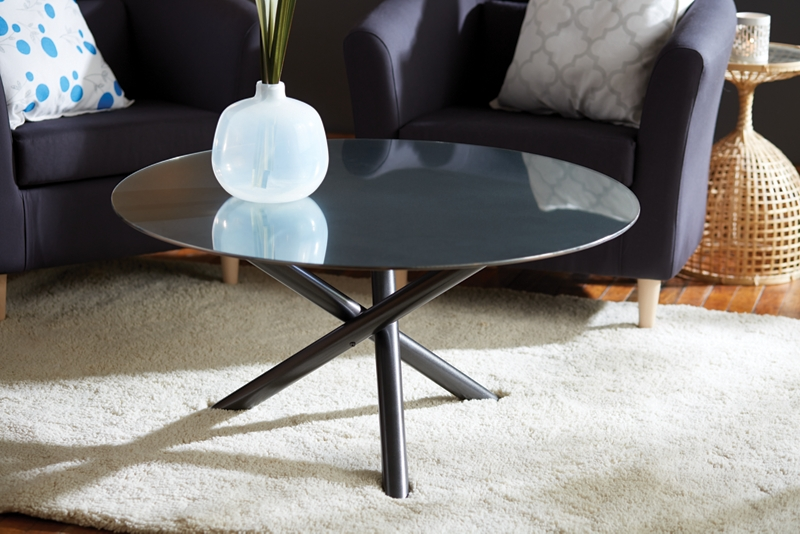 Paint the glass table top with thin coats of Krylon® Looking Glass Paint , allowing to dry between coats. Continue adding thin coats of paint until the desired look is achieved. Remove some of the shiny finish on the table legs with steel wool and then clean with aclohol. Tape off the suction cups at the top of the legs. Paint the table legs with Krylon® ColorMaster™ Primer in gray, and allow to dry. Then paint with Krylon® Shimmer Metallic Black Shimmer. Remove masking and let the paint "harden" a day or two and then assemle the coffee table. In order to get a good finish on the back of the glass table top be sure to lay the table top out on a flat level surface and spray paint with several very light coats.